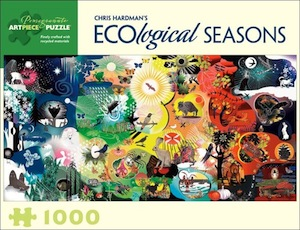 Ecological Seasons by Chris Hardman. Long before the first faint precursor of life, the Earth’s quartet of seasons had begun the melody to which every blade of grass and blue whale must dance. But the Sun plays different patterns over the surface of our sideways-spinning planet, and a winter in Florida bears little resemblance to a freeze in Fargo. Hence the astounding variety of life cycles from north to south. Everything depends on the plants, the only living things that can transform sunshine into sustenance. After the long, cold night of winter, spring rains germinate seeds and revive perennials. A rush of blooming growth feeds herbivores the nectar and green leaves they missed from winter solstice to vernal equinox. As bees navigate a floral path, their nectaries become fruit, yielding the seeds beloved of birds and squirrels. Then leaves flame and drop, reminding animals to eat, build dens, or move along. Winter is coming. Thoughtfully conceived and engagingly intricate, our 1,000-piece interlocking jigsaw puzzles combine superb color reproduction, stunning and unusual images, and sturdy construction to delight generations of novice and veteran puzzle workers. Puzzle made with recycled materials. Puzzle size: 32 x 16 in.